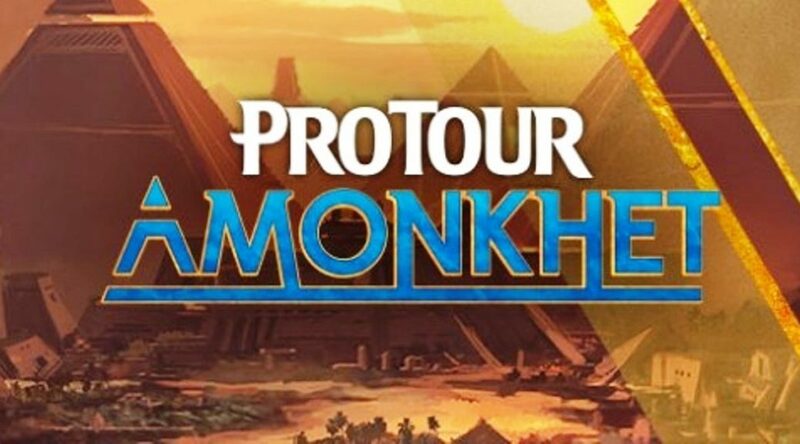 Check out our Pro Tour Amonkhet financial preview over here, and join us for round to round coverage in live blog style below all day. Look for color coded text if you don’t have time for the whole thing. Round 4 (1st Round of Standard) starts at 2pm EST/Noon PST, Friday, May 12th, 2017 after three rounds of draft. Here’s how things are playing out. Nevertheless, camera time has triggered the obvious buyout and New Perspectives is now bought out below $5. Wilson takes this match down 2-1. Patrick explains that he decided to run Amonkhet gods instead of planeswalkers due to the power of indestructible. Larsson is on a Cryptolith Rite deck sporting Bontu, the Glorified, a card that has been on my radar, but which hasn’t made much of a splash until now. Other cards include Vizier of the Menagerie, Walking Ballista, Catacomb Sifter, Manglehorn, Loam Dryad, Duskwatch Recruiter. Yamamoto manages to get an Ulamog, the Ceaseless Hunger onto the table in Game 1 and puts Larsson on the back foot. Game 2 doesn’t go much better for Larsson, who stumbles on lands a bit early and never manages to accelerate out past the reach of Marvel activation from Yamamoto. As we enter this match, the players are tied at a game a piece. Vizier of the Menagerie">Vizier of the Menagerie + Cryptolith Rite is tabled by Pardee, while Woo has a hoard of zombies. Ultimately it is an active Ormendahl, Profane Prince that puts the match away for Pardee and moves him to 4-1. 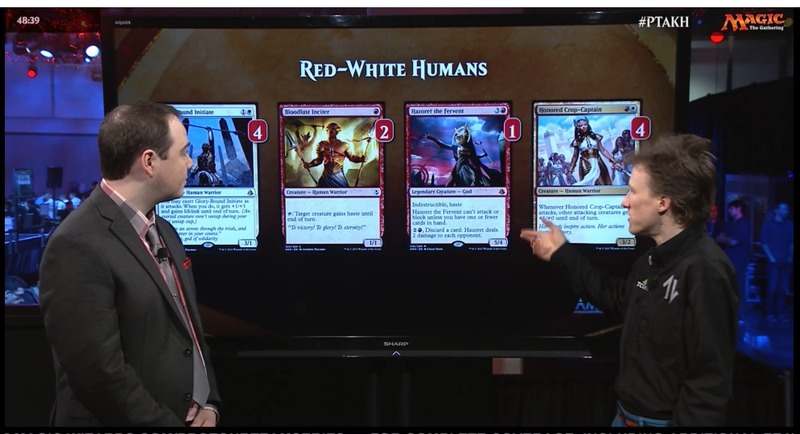 I’m hearing that 25% of the field is still on Mardu Vehicles. Lower than it could have been, but still pretty high. This build gives up a bit of mana consistency to have a much stronger sideboard. 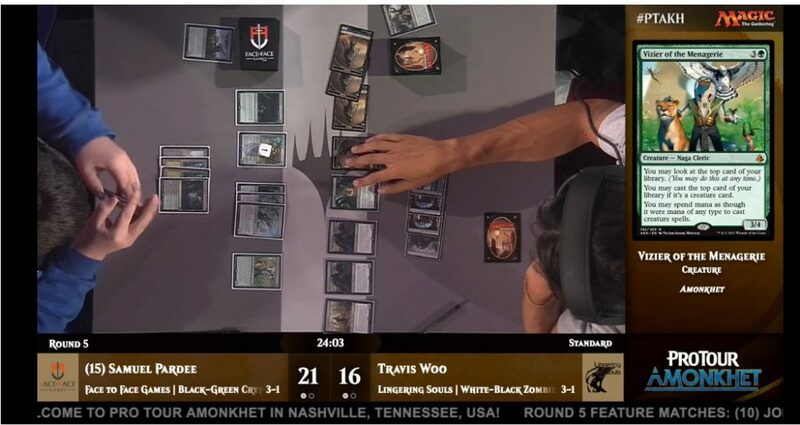 Here we see coverage again making the choice to show interesting decks instead of the players with the best records overall. Be aware that this may make certain decks seem more important in the meta than they really are. Game 1 hinges on a couple of missed land drops from Dickmann, leading to a quick concession in the face of overwhelming offense from the famed white mage. Game 2 is a tighter, more drawn out affair, but ultimately it is Patrick that takes it to even things up. In Game 3 Dickmann manages to keep the pressure on Wescoe, who draws a few too many lands to stay in the race. Wescoe drops to 3-3, while Patrick moves to 4-2. Owen Turtenwald is now at 5-1 on Mardu Vehicles. Paul walks us through the UR Control list that has been posting solid results on MTGO lately. The highlights here include 4x Disallow, 4x Torrential Gearhulk and 1-2x Commit//Memory. IN Game 1, Chris Fennell manages to get a ridiculous mass of zombies onto the table, leveraging Liliana’s Mastery and a posse of Wayward Servant to make the pile of assets on Marc’s side moot. Zombies takes Game 1. The reach of the white splash via drain effects really paid off in this game. Wayward Servant is commonly available at $0.25, but could easily end up as a $3-4 uncommon this season if zombies proves out this weekend and through the next few major events. Diregraf Colossus inventory has been draining out at $3, and the card could end up at $6+ by the end of the weekend. The next game isn’t much better for the Marvel player, and WB Zombies in the hands of Fennell goes to 7-0. On the back table, Ari Lax casts an insane six Ulamog, the Ceaseless Hunger in a game he eventually wins the first game against Alex Sittner on W/U Spirits after casting the Memory half of Commit/Memory. Sittner strikes back to even it up off camera, and in the third game Lax manages to find an Ulamog off Aetherworks Marvel to take out two potential attackers & lock up a victory to move to 4-3. Craig is one of the only players on this list at the tournament so it’s unlikely to have much impact. This list is pretty similar to what we’ve see here. 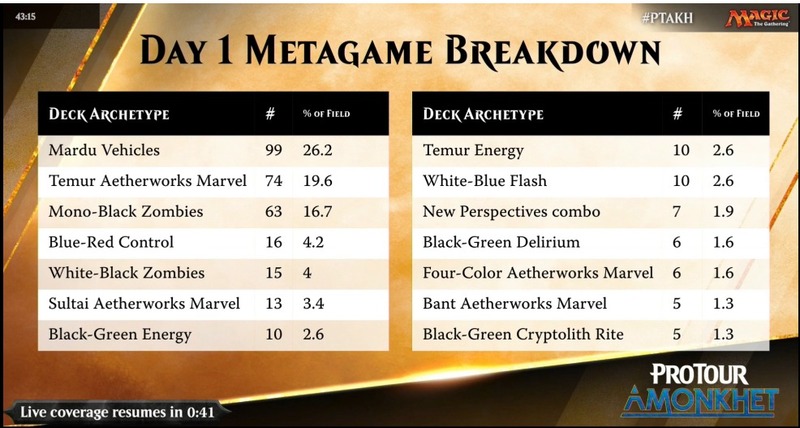 Here we see a solid falling off for BG Delirium decks, but Mardu Vehicles still making up a full quarter of the field. Marvel at nearly 20% could lead to further gains on their banner card (currently tough to find under $10) if it gets a strong contingent into Day 2 and on to Top 8. 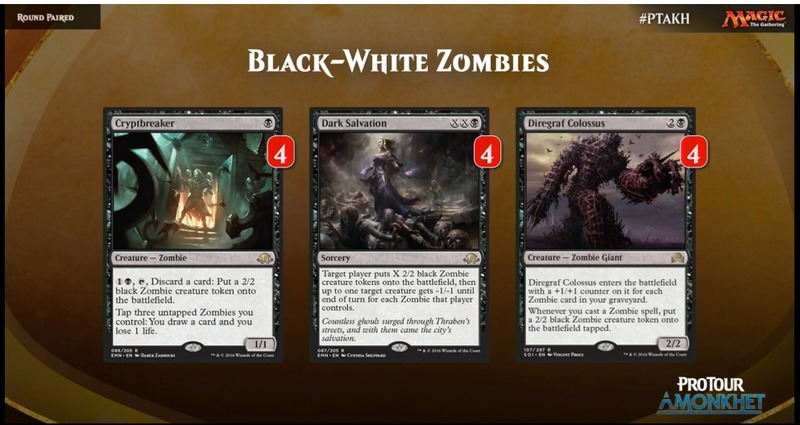 Zombies is the only other archetype over 15% and then we have 10+ other deck types with minor showings. This all suggests that the pros had trouble establishing consensus across teams on which decks were best in this newly minted format. Here we have a Marvel deck already well positioned for Day 2 success against one of the few aggro energy deck pilots. Marvel spins don’t quite pay off as hoped in Day 1 and Dagen is able to take the first game. In Game 2 Oliver again hits a low impact spin off his Aetherworks Marvel, netting a Servant of the Conduit against a board of aggressive threats (Greenbelt Rampager, Glint Sleeve Siphoner, Winding Constrictor) from Dagen. In the final game Oks ends up with a trio of Ulamog caught in his hand, and after many turns Dagen is able to put things away. It’s Wescoe on RW in Round6. Not a second Travis Woo. Fyi T-woo lost to Ormendahl, he did not win with it. I wish someone would post more of what the top pros are running. No need for in depth card breakdown, but knowing the deck type would be awesome. 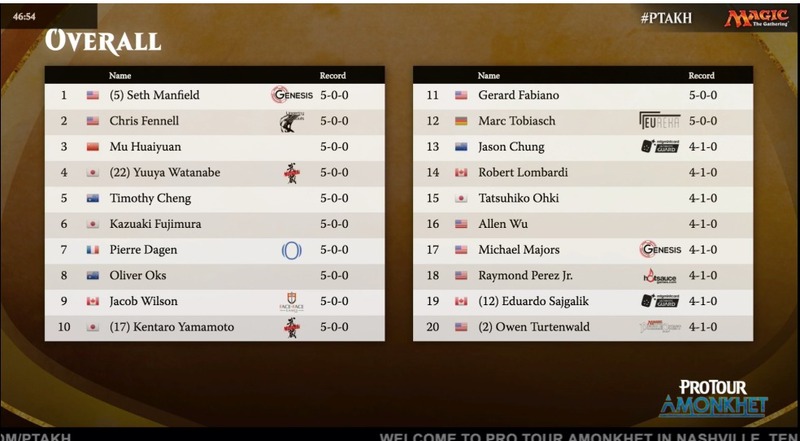 I’d love to know what decks the Genesis players are running. Maybe even the decks that are surprising from lesser known players and the players expected to do well but maybe guessed the meta wrong.